Tokyo represents the modern face of Japan, while at Kyoto you will experience the most traditional way of life that Japan has to offer. 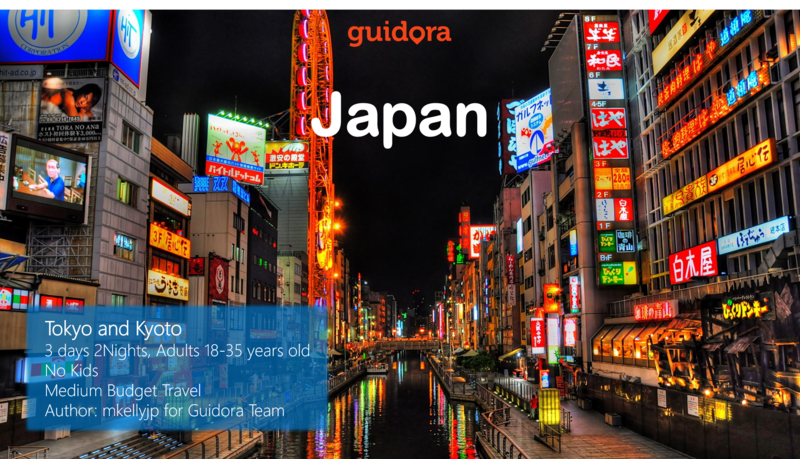 You will be equally amazed at both places, so if you have 3 full days to spend in Japan, we will show you how to accomplish to see the best of both cities and how to move around. In this itinerary, we have put together the best of Tokyo and Kyoto in 3 days. It will guide you on which hotel to stay, so as to have easy access to all the suggestions of the itinerary, it will give you information on the restaurants you should eat, on the prices, on how to move around and on the places you should visit in the night. It is also full of useful tips on how to transfer from the airport, changing money, local tips and hard to find secrets and food suggestions. This itinerary has only one and perfect suggestion for each hour of the day, so that you don’t get lost into looking for information. You just follow the travel itinerary plan and you will enjoy the best 3 days of your life in Japan. It will help you save time, save money and eliminate the stress from organizing your trip. It’s exactly like having your best friend there, guiding you around.